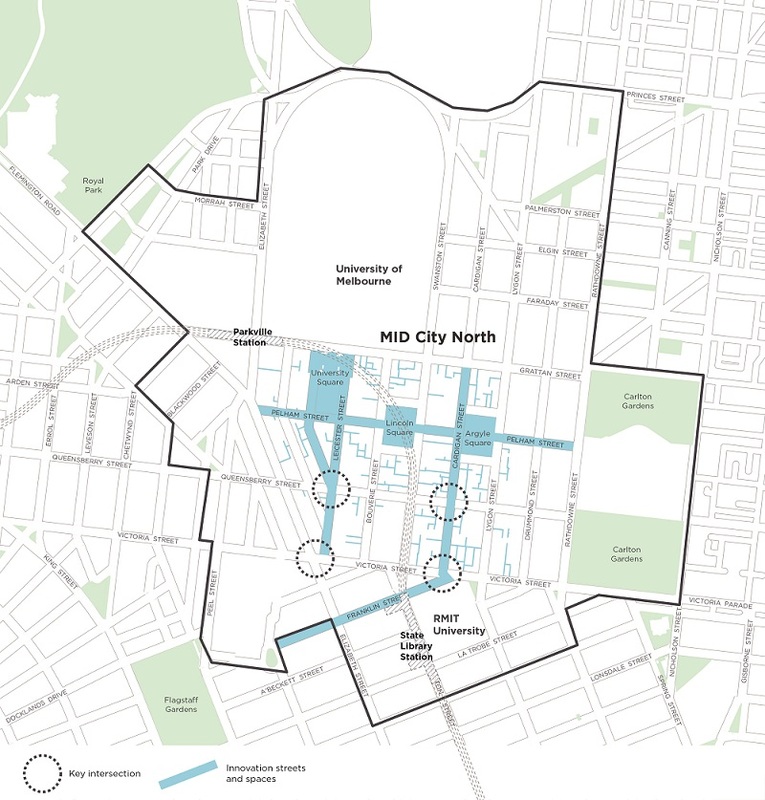 Developing a five-year plan to improve and connect spaces in Melbourne's innovation district City North. Melbourne Innovation Districts (MID) is a partnership between the City of Melbourne, the University of Melbourne and RMIT University. This initiative is set to drive investment in the knowledge economy and help shape our city’s future. 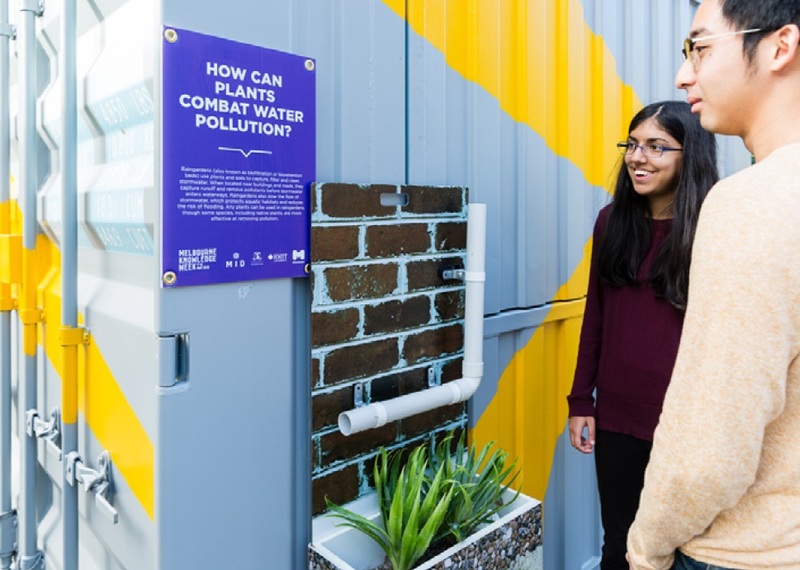 MID will provide more opportunities for Melbourne’s knowledge workers, researchers, students, business and community organisations to connect and collaborate, creating innovative ideas essential for the city to continue to thrive and prosper. The area is home to 21 per cent (60,260) of all knowledge sector jobs in Melbourne and features the central campuses of RMIT and the University of Melbourne, State Library Victoria, Queen Victoria Market, Royal Exhibition Building, Trades Hall and the Melbourne Museum. The MID partnership has selected City North as the first of its innovation districts because of its long and successful history of innovation, and the concentration of knowledge institutions and investment in the area. During this period of change, there is an opportunity to strengthen partnerships and share investment to benefit the knowledge sector and innovation. Public realm – rethinking the ways spaces can enable innovation activities such as testing, showcasing and engagement. Enterprise activation – providing targeted support for startups and small to medium enterprises to establish and grow within the district, and make productive connections with other parts of the innovation ecosystem. Digitally-enabled technology – enabling better analysis, insight and collaboration through accessible state-of-the-art and experimental technology. Social innovation – developing, collaborating and researching in new ways and combinations to better meet social needs. Institutional design – tweaking rules, policies and culture to that motivates status quo behaviour and activities are tweaked to better unlock potential in the ecosystem. Cardigan Street (Carlton) was temporarily prototyped as an Innovation Street during Melbourne Knowledge Week 2018. 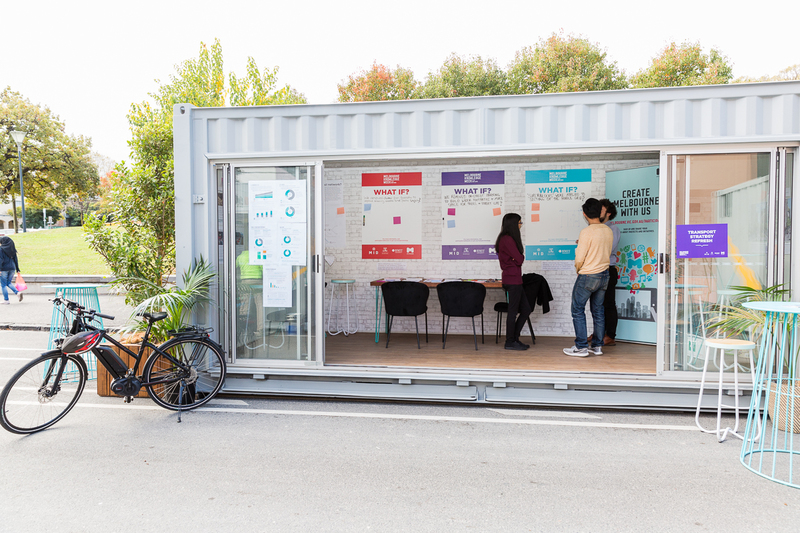 Modified shipping containers used as engagement sites within Prototype Street - a Melbourne Knowledge Week 2018 activation. 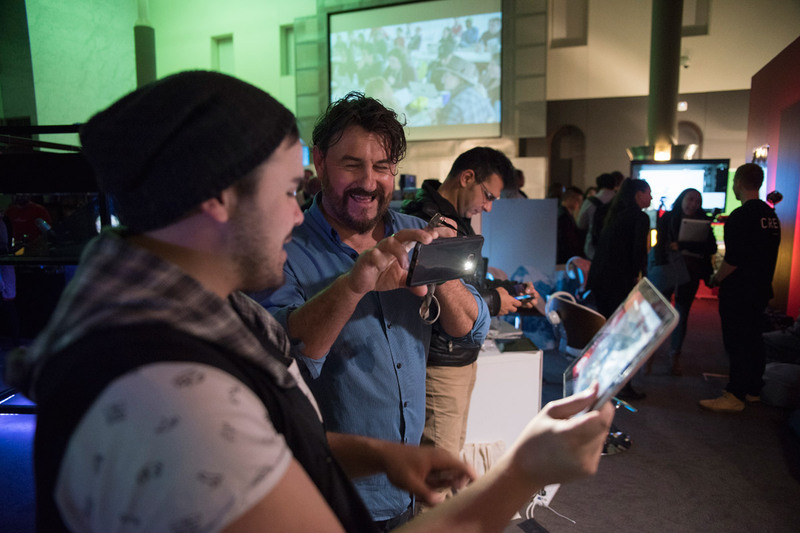 Testing technology at the festival's hub. 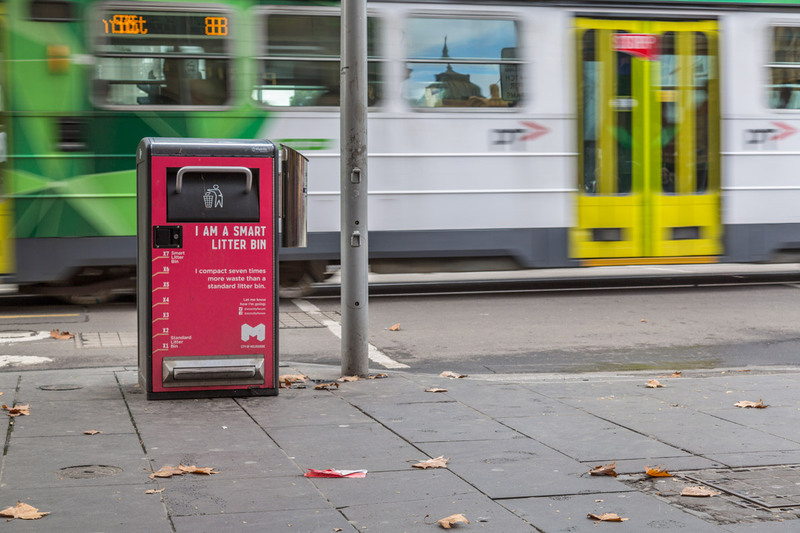 Testing new technology on our streets like this smart bin. 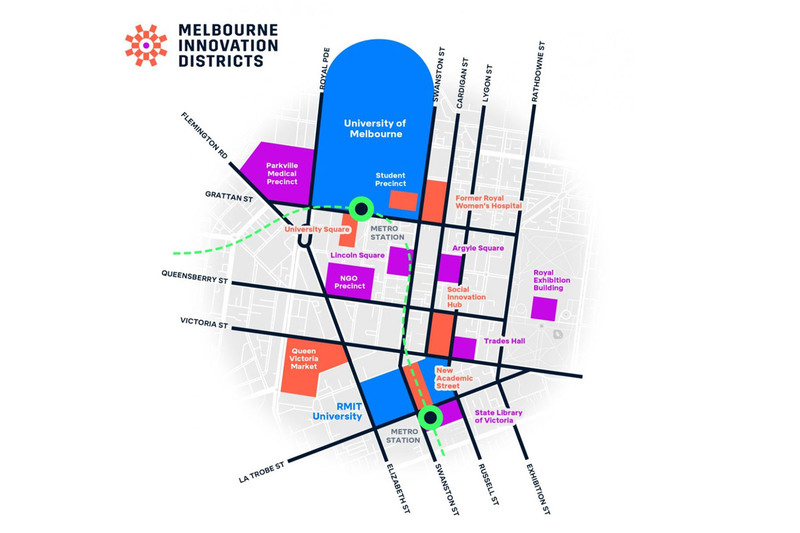 The extent of the Melbourne Innovation Districts area. Vans, trucks or trailers modified to act as mobile innovation hubs. Read more in the draft Urban Realm Action Plan. Tell us your ideas on how we can continue to make the area a thriving hub for innovative people and creative activities. Rank from most to least important. These are the latest updates on the progress of the project. Follow the project to stay in the loop.